Trevesta broke ground in 2016 on a 441-acre site on the southeast intersection of Buffalo Road and 69th Street East. This project’s east Palmetto site, formerly known as Pennington Place, has been approved by the Manatee County Commission for 1,103 residential units and 100,000 square feet of commercial space. 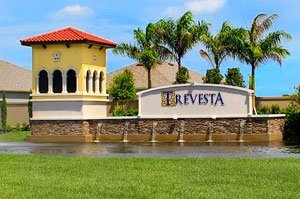 Trevesta’s residential component is further broken down into 803 single family homes and 300 multifamily units. The main development concept of Trevesta centers on family life, as the community’s name indicate. Its name is a combination of the prefix tre, meaning three for man, woman and child, and Vesta, the Roman mythological goddess of hearth, home, and family. In keeping with this theme, 223 acres of the Trevesta site have been set aside for nature preserves, lakes, recreational areas, and open space. 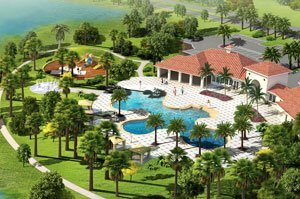 The banks of the main lake namesake to the community served as the perfect setting for the community’s Lake Trevesta Club, the hub for a wide array of amenities for the residents. This amenity center occupies over four acres, featuring a 5,600-square-foot clubhouse. Its facilities include a fitness center accessible for 24 hours daily and multipurpose rooms for neighborhood events organized regularly by an activity director. Trevesta likewise provides its residents with a beach-entry pool, an interactive splash park and playground. The community center’s superbly landscaped grounds with cabanas, lakeside trail and vast open space further spice up the Trevesta lifestyle. Choosing from amongst Trevesta homes for sale entails looking at choices from the four builders in this community: D.R. 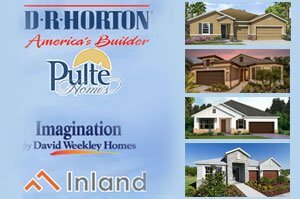 Horton, Pulte Homes, Inland Homes, and the Imagination division of David Weekly Homes. A great majority of the initial sales in this community were builds by national housing giant D.R. Horton, which offers 13 floor plans in Trevesta. These D.R. Horton offerings come in one and two-story designs, featuring floor areas of between 1,800 and 3,900 square feet designed with three to five bedrooms. The pricing of these homes is in the $200s‒$300s range. Pulte Homes’ lineup in Trevesta consists of nine designs also priced starting from the $200s. This builder’s choices likewise include one- and two-story homes having floor plans roughly equivalent to those of D.R. Horton’s. Inland Homes has fielded two bets in Trevesta, which are distinctive in their coastal, craftsman and Spanish architectural style and competitively priced too in the $200s‒$300s. These choices are for designs with 1,708 or 2,870 square feet good for three to five bedrooms. As to be expected, the pricing of the Imagination unit of David Weekley Homes is in the same ballpark as the price quotes of the other three builders in Trevesta. This builder’s home designs for this community measure from 1,897 to 3,307 square feet for construction in 50 and 60 ×120-square-foot lots, options that certainly make for great pickings on Trevesta homes for sale. Below are the current real estate listings available at Trevesta.